Dictogloss is a language teaching technique used to teach grammatical structures best in groups. Challenging and fun, Dictogloss is task-based, interactive, and collaborative. Useful even among advanced learners, Dictogloss is best appreciated by beginning Nihongo students as it offers sufficient student support. 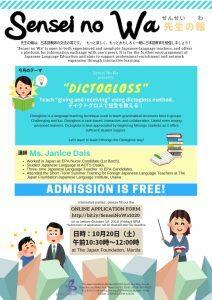 Let’s learn to teach Nihongo the Dictogloss way! Worked in Japan as EPA Nurse Candidate (1st Batch). Studied Japanese Language at AOTS Osaka. Three- time Japanese Language Teacher to EPA Candidates. Interested parties, please fill out the ONLINE APPLICATION FORM http://bit.ly/SenseiNoWa1020 on or before October 19, 2108 (Friday) 5PM.